Lucy Bloom is broke, been dumped by her boyfriend, and had to sell her house to send her nineteen-year-old son to drug rehab. So when she’s offered a high-paying gig helping clear the clutter from the home of reclusive and eccentric painter Marva Meier Rios, Lucy grabs it. She rolls up her sleeves to take on the mess that fills every room of Marva’s huge home, but Lucy soon learns that the real challenge may be taking on Marva, who seems to love the objects in her home too much to let go of any of them. While trying to stay on course toward a strict deadline—and with an ex-boyfriend back in the picture, a new romance on the scene, and her son’s rehab not going as planned—Lucy discovers that Marva isn’t just hoarding: she is also hiding a big secret. The two form an unlikely bond, as each learns from the other that there are those things in life we keep, those we need to let go—but it’s not always easy to know the difference. "Simultaneously breezy yet thought-provoking, this is a fun read that stays with you." Meet June Parker. She works for L.A. Rideshare, adores her rent-stabilized apartment in Santa Monica, and struggles with losing a few pesky pounds. But June’s life is about to change. 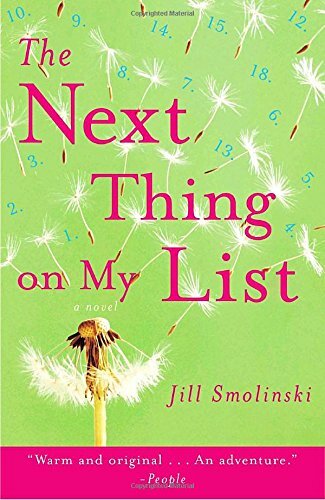 After a dark turn of events involving Weight Watchers, a chili recipe and a car accident in which her passenger, Marissa, dies, June finds herself in possession of a list, “20 Things to Do By My 25th Birthday.” Even though they barely knew each other, June is compelled by both guilt and a desire to set things right to finish the list for Marissa. The tasks before her range from inspiring (Run a 5K), to daring (Go braless), to near-impossible (Change someone’s life), and as June races to achieve each goal before the deadline, she learns more about her own life than she ever bargained for. Hawaii may be the island of romance, according to travel brochures, but for Keeley Baker-Kekuhi, lately it’s been anything but. She’s broke, stuck in a dead-end job studying an extinct volcano—and her husband, Kam, has just dumped her for a hula dancer. Even worse, he’s now demanding custody of their four-year-old son. No wonder she’s about to throw in the towel on love. Enter Ian Gardiner, an artists’ rep whose boyish good looks catch Keeley’s eye. It may be his connection to one of Britain’s most famous pop icons, however, that stands to capture her heart. But is he just too good to be true…? To see a list of Jill's novels in other languages/countries (including links to where you can buy them), click here.